Young Cornish talent Clarity already has a number of releases under his belt - most notably releases on Med School's New Blood 011 and 2012 follow up album Blood Pressure. 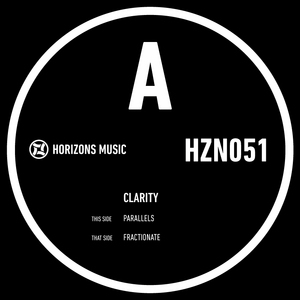 Here he turns his talents to Horizons with a couple of super strong releases, which further carve out his career in the D&B world. "Parallels" is dominated by crisp, taught breaks, tense SFX and booming bass with atmospheric warps, hisses and sweeps. The accompanying "Fractionate" is a more meditative cut with white noise crackling, a cooing vocal, warm, undulating bass and a pervasive melancholy. Definitely worth checking.